I WENT BACK in time last night. Actually, I will do it once or twice a week this fall. And I love it. A few weeks ago David Adam, sports editor of The Herald-Whig, called and asked if I'd be interested in working a night or two a week in sports. Sure, why not? I was a sports guy for 10 years. 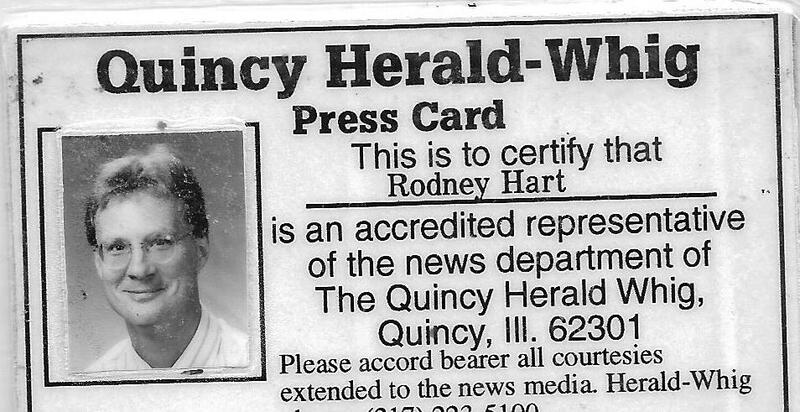 I covered a few basketball games for The Whig in the past couple of years. 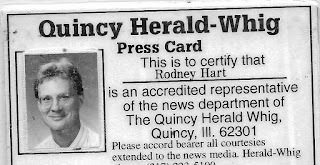 Last fall I worked for the online Quincy Journal writing about high profile murder trials (the Journal has since folded). Keeping the toes in the water is not a bad thing. I was in the Whig office last Friday and last night, taking a few calls and helping some of the younger guys. I'm looking forward to covering a few high school football games this fall. I have the time, it's fun and it's like going back to simpler times. Staff Writer Matt Hopf was working his evening shift last night, so I wandered over to his corner of the newsroom, where I sat for probably a decade. We pulled open a drawer and it had a bunch of my old crime and courts stuff - police reports, victim impact statements, a Court TV video from the 1993 levee break, old political stickers, etc. There was even a full box of my old business cards. I left the Whig four years ago and the drawer hasn't been touched. I don't miss my old job, but I did miss some of the people I used to work with, so it's fun being back. David has hired some college kids to take calls and write up short stories, and they really bust their butts - it's fun to watch them get the hang of it. Last night I took a call from Quincy Notre Dame soccer coach Greg Reis and "it was just like falling off a bike," as former Quincy University legend Jay Driscoll used to say. Once a sports guy, always a sports guy, and I'm proud of it.